Stress is a universal problem that’s more than just a nuisance. The American Institute of Stress indicates that not only is stress the basic cause of 60 percent of all human illnesses and disease, but it causes 10 percent of strokes, three out of four doctor visits, and reduced grey matter in regions of the brain tied to emotional and physiological functions. Being able to properly handle stress is an important way to help maintain overall good health. Because stress is so damaging, April is Stress Awareness Month and everyone, from teenagers to retirees, are encouraged to recognize what causes stress in their lives and manage it in healthy ways. As national caregivers, we see the negative side effects of stress firsthand and offer these four ways to reduce it in your life and the lives of your loved ones. Write things down: As we age, our minds will tend to forget little things, leading to frustration and increased stress. Even the cause of stress can be forgotten, creating a new challenge for you and your aging loved ones. We recommend writing things down, including to-do lists, medication reminders, and even answers to problems that may be cluttering your mind. Putting thoughts on paper can help you see solutions much clearer to help reduce daily stress. Exercise: Physical activity brings a number of benefits to your life, including reduced stress. The American Psychological Association cites that 53 percent of adults feel better about themselves after exercising, 35 percent say it puts them in a good mood, and 62 percent that say they exercise as a stress management tool, claiming it to be very or extremely effective. Exercise is also very important for seniors to maintain an active and healthy quality of life. Be social: When stress starts to grow, confiding in a family member, friend or companion can help reduce it and bring your emotional state back to a healthy level. Social activity can also help support mental health and keep aging adults sharp. Find a furry friend: When stress and depression levels are high, animals can help lighten your mood and bring a slice of happy to your world. Playing with dogs and cats can increase calming levels of serotonin and dopamine, and in individuals 65-years-old and older, pets have been shown to help reduce doctor visits by 30 percent. 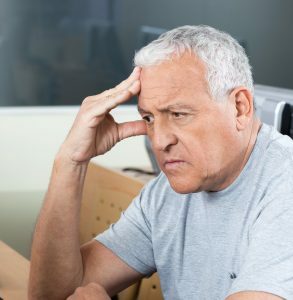 Stress is a dangerous ailment, especially for our aging loved ones. Having in-home and companion care can help by offering a service that builds a culture of care in the comfort of your family’s home. To discover more ways to manage stress for your loved ones, make sure to “Just Ask FirstLight.” Our helpful caregiving team can help answer the tough questions you’ll have as an acting caregiver yourself.